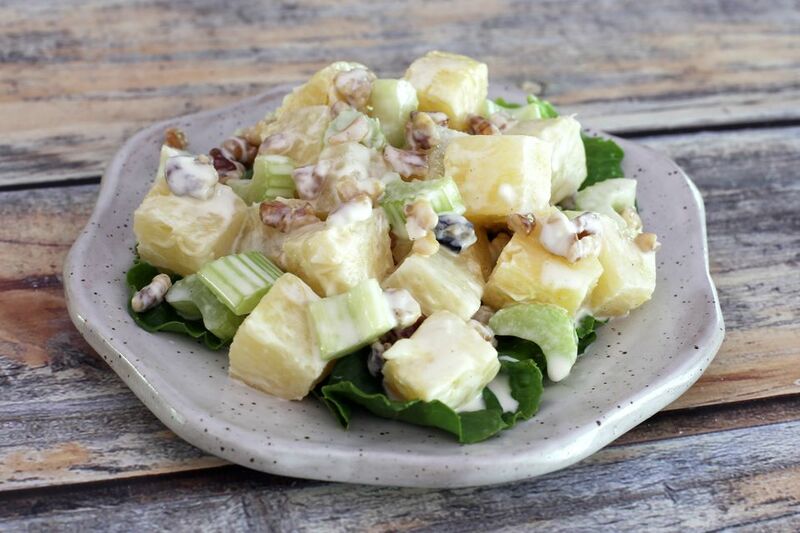 This pineapple salad is similar to one of my favorite fruit salads — the Waldorf salad. The chunks of pineapple give it a refreshing, tangy change from the typical fresh apple chunks. Feel free to replace the chopped walnuts with pecans or toasted nuts, and add some raisins or dried cranberries, if desired. The salad is fabulous with baked ham or pork, and it takes just minutes to fix. If you have a can of pineapple chunks and walnuts in your pantry, you can have this tasty, fruity salad on the table in just 5 to 10 minutes. The salad is easily scaled up for a large family dinner or holiday meal. It's also an excellent choice for a summer cookout. Or take it along to a potluck dinner. In a bowl, combine the drained pineapple chunks, celery, and walnuts. Just before serving, add enough mayonnaise to moisten, along with the lemon juice and a dash of salt, to taste. Serve on lettuce leaves or mixed salad greens.